In a blink of an eye on September 30, 1955, a tragic accident ended the life of a Hollywood icon and gave birth to an international legend. When James Dean was killed on a California two-lane highway, few people had heard of the diminutive car he was driving—a Porsche 550 Spyder. After that day, it became the most famous European sports car of all time. During that time, American automakers were just getting around to creating two-seat sports machines. The bulk of cars in this niche were British and Italian. Porsche had created a stir with its 356, but production numbers and global popularity lagged behind the more popular MG-T series, Jaguar XK120/140, even the Alfa Romeo and early Fiat models. However, the upstart Porsche was more nimble, better balanced and offered the distinction of being a rear-engine roustabout. It was only a matter of a few more model years before the 356 was putting the screws to the Brits and forcing the hand of Italy’s automakers. The entire brand needed exposure, and the death of James Dean was an unforeseen accelerator of that cause. Right from the beginning, the 356 was a European sports car star. With the simplistic engineering and manageable power/handling, sports car enthusiasts started slapping numbers on the doors and going racing. Before too long, demand for a more competitive and purely race-bred Porsche grew to a point that Dr. Porsche could not ignore. Thus, the 550 Spyder was created. Ferry Porsche, son of Ferdinand Porsche, was in charge of the project. Early versions were reported to have been tested in late 1951. But it was the introduction at the 1953 Paris Auto Show that properly exposed the low-slung racer to the automotive world. Beginning in 1953 and ending in 1956, only 70 Spyders were constructed. And, we know for a fact that no more than 69 survived. Being both famous and infamous, the 550 has become the most iconic (and perhaps) valuable Porsche in history. Much like Porsche did over 50 years ago, Schuco, another premium German brand, is traveling in the same footsteps. A longtime European favorite, the brand has had a much harder time gaining traction in North America. This 550 Spyder, however, clearly establishes Schuco as a player in the premium collector diecast world. Schuco ventured into this realm with a more stylistic approach rather than doing what was simply expected. The end result was a 1:18-scale diecast that will likely prove to be very collectible. Without question, the most striking feature of the exterior is the shocking blue finish with white accents running the apex of the rear fender lines. This is in stark contrast to the more common silver finish. As stunning as the color may be, the enormous attention to detail is what was really impressive. From the nose rearward, the headlight buckets and lenses are about as good as reviewed in this scale. A tilt-forward front lid features a precision-cut opening for the racing-style fuel filler door. A reduced height windscreen gently hugs the curvature of the main body shell. A very impressive side-view mirror shell is mounted on the driver’s side fender. Just below, and in the corresponding position on the right fender, is the famous “Spyder” script. The tilting rear body component offers two leather hold-down straps. The twin cooling vents are not simply photo-etched and indented grates but actually two separate pieces that pass though to the engine compartment. The finishing pieces are the two simple, but effective, rear taillights with chrome bezels. The fit/finish is first class. Although a bit delicate, the exterior is very inviting and begs to be handled. Early Porsches were not known for their gut-busting power. Rather, the brand became famous for its blend of overall performance. Power for the 550 was a 1.5-liter, air-cooled, aluminum flat-four-cylinder engine that produced a maximum of 110 horsepower. For this, the driver and one passenger could rely on just 88 lb.-ft. of torque. By today’s standards, one might think that a Prius could outrun a 550. But the little flat four had only a 1,200-pound burden to push through the air with a coefficient of drag that was remarkably sleek—especially in a time prior to wind-tunnel testing. Under the rear clip Schuco created a very detailed scale rendition of Porsche’s efficient power source. Two very realistic carburetors top the basic flat engine configuration. Each carb is finished with air filters with real screen mesh. A twin coil pack was mounted aft of the engine and just fore of the spare tire and wheels with real leather tie-downs. The wiring and plumbing was very nicely executed. The underbelly of the lid offered the quality of finish that matched the exterior. Early Porsches were also not known for their creature comforts. Instead, it was function over form. Schuco superbly captured this essence with an interior that is plain, simple and nearly perfect. The doors smoothly and effortlessly opened with a simple hook-and-catch method. The door panels were trimmed with a border and cove effect in simulated parchment leather. Each door had chrome latch pulls. A flat, smooth dash is home to a remarkably realistic gauge cluster and banjo-style steering wheel. Other touches included a trio of control knobs, three grab bars and ignition keys. The bucket seats were perfectly done as were the foot pedals. But by far the coolest feature was the exposed space frame that ran through the heart and soul of the diecast. Flipping the front compartment lid showed off an aluminum aircraft-inspired fuel cell. Schuco went the extra steps of adding pump sender lines to the correct positions. The battery (with metal hold-down) sits up front for better weight balance. The lid is secured with a hook-and-catch supported by a real leather limiting strap. Much of the suspension was concealed under a full-length belly pan. There are hints of excellence as seen by the front anti-sway bar and bushings and spindles. The rear of the underside was highlighted by the equal-length headers linked to white heat-resident mufflers and tailpipe. Schuco did an amazing job of recreating the wide lug pattern Porsche wheels and primitive bias-ply performance tires. Even the pigeon-toed, off-camber effect of the rear stance looked correct. Since that day Joe introduced us to the little silver Schumatic Porsche 356-A I had to get one. Now I am hood on the quality. 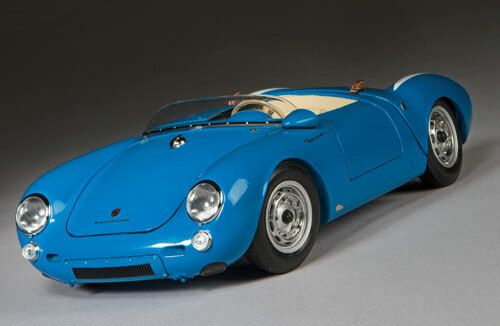 I want my next model in the Porsche Line to be the 550 spyder from Schuco. when I started I concentrated on Ford must and Fairllane for the 1960s. & Mercedes-Benz racing CMC cars from the bi gone era. Now because of the quality and information I owe to my friend Joe Kelly JR and the Legacy 1:18Th forum I have a diverse collection as well as books on the cars and why part they played in history of transportation. I am very careful to choose only the best that represent the subject matter at hand. when I finally put the piece of my puzzle together I hope it will represent a diverse collection of American Iron from Ford , Mercedes–Benz, Porsche finest and other diverse diecast models in both 1:24Th scale and 1:18Th scale along with books that can tell the story of automotive transportation and racing of the 20Th century. You’re one of a VERY few people here in the US who have that Schucomatic car (for those who don’t know what that is, it’s a radio control 1:18 die cast – truly sweet). And I’d highly recommend that Spyder – it’s beautiful. Keep up the collecting – there’s a lot of great stuff coming out in the future months, and we don’t want you to miss a thing!